The drive to High Island took us past lots of farmland. One field of short grass was worth a stop. We had five flying Upland Sandpipers, lots of Hudsonian Whimbrels, an American Golden Plover, Killdeer, about 60 Tree Swallows moving through, two Green Herons, Eastern Meadowlark and Lesser Yellowlegs and a few Savannah Sparrows. Continuing the drive we added a few Eastern Kingbirds (scattered but common), Red-winged Blackbird, and a Belted Kingfisher by a pool of water. In the midst of a huge marshland there is High Island. High is a relative term – at least it's higher than the surrounding marsh (on a salt dome) and so large trees can grow there. It is reached by driving down route 124 from Winnie. We intended to drop into Boy Scout Woods (Louis Smith Woods) on High Island for a twenty minute quick check to see if there was anything about. This was at 9.10am. The next time I looked at my watch it was 3.10pm – six hours later – we were still there! 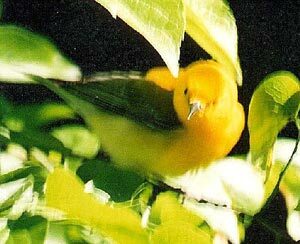 We had barely got a few metres from the entrance and we were watching two very close Prothonotary Warblers! These birds were at times close enough to touch! (watch out – more exclamation marks ahead). Also from here we saw a great male Rose-breasted Grosbeak. After watching these top birds we went to the seats overlooking the drinking pool and sat down, still with huge grins on our faces. The dripping hose and pool was good at attracting birds – we had two Brown Thrashers, a Gray Catbird, a female Hooded Warbler and a Louisiana Waterthrush. Suddenly word arrived of 'Blackburnian at The Cathedral'! Off we hurried and quickly got the bird. Another 'stonker' on the list. We hung around The Cathedral for a while getting Red-eyed Vireo, Eastern Kingbirds and lots of Scarlet and Summer Tanagers. A Black-and-white warbler was found then a Golden-winged Warbler! Orchard Orioles moved through the trees and Yellow-breasted Chat, Yellow-billed Cuckoo and Eastern Wood-pewee were all located and admired. Risking a move away from The Cathedral we had a very close male Black-throated Green Warbler (feeding right over our heads!). Then we heard a singing Northern Parula, alerted our colleagues and soon found the bird showing well (of course!). A bit further down the path a fine male Hooded Warbler showed excellently. We then walked further around the wood adding Ovenbirds and Wood Thrushes feeding on the ground under the bushes – all seen well after some effort. Then a female American Redstart literally dropped from the sky into a tree nearby. A Kentucky Warbler was reported and it took about an hour to track it down – we were always in the wrong place, most frustrating to say the least. Once we had found the bird we could smile again – until the next lifer was called! I left the group for 'a call of nature'. As I did the necessary, hands busy, a bird flitted into view, visible only from where I stood. Sacrificing all I grabbed my bins and looked at it. Frantic zipping followed and I called to the others that I'd just had a fine male Magnolia Warbler. We spread out to search for it again. I again found the Kentucky Warbler and flitting above it turned out to be the Magnolia Warbler. Frantic whispering and gesticulating finally meant all saw the bird well. A huge relief. Back at The Cathedral things were still being found. A couple of Tennessee Warblers moved through, then a Chestnut-sided Warbler showed well. A Worm-eating Warbler was found – very mobile and hard to see but we all got it well in the end, and a bit-dull Orange-crowned Warbler. Nearby was a Yellow-bellied Sapsucker, well hidden on a tree trunk. Nearby we had Indigo Buntings and a Swainson's Thrush. At the drinking pool we had a lone Common Grackle and a male Ruby-throated Hummingbird drinking from the dripper! Back near the van we found a strange-looking male Blue Grosbeak still in first-year plumage. 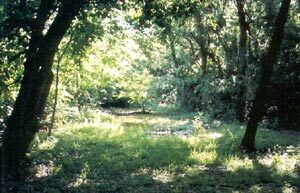 Also on High Island is a place called Smith Oaks Nature Sanctuary. This is much larger than Boy Scout Woods so the birds can be spread over a wider area. However, it's still always worth a vist in migration time. We reached Smith Oaks at about 3.30pm. Pretty soon, at the edge of the carpark, we were watching a pair of Blue-Gray Gnatcatchers and listening to a singing Northern Parula. In the same tree we had brief views of a Downy Woodpecker. There are lakes here but we limited ourselves to the woods. However, we did get some water birds fly overhead: Roseate Spoonbill, Double-crested Cormorant, Tricolored Heron, Little Blue Heron and Snowy Egret. As we headed into the woods we came across another singing Blackburnian Warbler. In the wood we found a small group of birders who directed us to a high and well-hidden spot in a tree. In the 'scope we could see red-phase Eastern Screech-owl - very rufous indeed. Also in the wood were Rose-breasted Grosbeak, Eastern Kingbird, Summer Tanager, Yellow-throated Vireo, Baltimore and Orchard Orioles and Red-eyed Vireo. Another Yellow-bellied Sapsucker was found climbing a tree and two more Prothonotary Warblers out in an appearance. We gathered in a woodland glade where there were lots of birds feeding on a bery bush. They were mainly Indigo Buntings but we also saw Tennessee Warbler, a female Red-winged Blackbird, a Veery, and, the highlight, a male Cerulean Warbler. We also found a Great Crested Flycatcher just as we were leaving. That evening, around the restaurant, we watched a Common Nighthawk flying around the street lights, considerately calling to confirm its identity. Next day we were back at High Island, again at Boy Scout Woods, where visited Purkey's Pond area (back by the entrance and the drinking pool). The fall was over and many birds had moved on but we did get a female Scarlet Tanager, a male Summer Tanager and a male Rose-breasted Grosbeak plus a pair of Indigo Buntings, a Yellow-breasted Chat, three Gray Catbirds and a female Prothonotary Warbler. Back in the woods we found Wood Thrush, as ever under the bushes and hard to see, two White-throated Sparrows, Blue Jay, Red-eyed Vireo, male Hooded Warbler and Eastern Kingbirds. 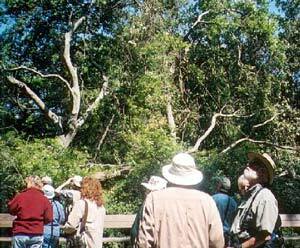 Many people had a lifer in the form of a male Blackpoll Warbler moving quickly through a tree. There is a newish pond here as well, surrounded by reeds. Here we picked up Green Heron, Marsh Wren, Red-winged Blackbird, Great-tailed Grackle, Eastern Kingbird and a pair of Northern Cardinals. Helen spotted a nice male Orchard Oriole in a tree and someone found an American Purple Gallinule at the edge of the reeds. Finally here a Mottled Duck flew past. Back again in the woods we relocated the Kentucky Warbler and at least two Worm-eating Warblers all of which showed very well and again saw the Louisiana Waterthrush. During our final day at High Island, between visits to Anahuac, we visited a series of pools Vaughan knew of. They were away from the wooded areas on an oilfield and as we drove in an Osprey flew nearby. The pools are surrounded by about ten 'nodding donkey's diligently pumping oil from the depths. We hadn't seen Stilt Sandpiper and this might well have been our last chance. All I can say is 'well done Vaughan'. As we reached the pool we saw 13 Stilt Sandpipers feeding in the water, later joined by another 13 individuals. Also here were Short-billed Dowitchers, a single Long-billed Dowitcher, Black-necked Stilt, Western and Semipalmated Sandpipers and a Sanderling. There was a group of terns and gulls sitting on a beach comprising Royal, Caspian, Common and Sandwich Terns plus Laughing and Ring-billed Gulls. One Laughing Gull showed white mirrors in at least four primaries giving us reason to check it carefully but we eventually concluded it was a slightly aberant Laughing Gull. Further along the beach we found Spotted Sandpiper and behind the gull/tern group were Semipalmated, Black-bellied and Wilson's Plovers. Then it was back to Boy Scout Woods were we sat on the 'bleachers' scanning the drinking pool and area. Migrant birds were still around and we saw male Summer Tanager, Worm-eating Warbler, a first-year male Painted Bunting (very subtle and beautiful colours on this bird), male and female Indigo Buntings, looking fantastic when in the sun, Brown Thrasher, a first-year male Orchard Oriole, Swainson's Thrush, Gray Catbird, two female and two male Rose-breasted Grosbeaks, Red-eyed Vireo, Blue Jay, Northern Cardinal, Common Grackle and a Ruby-throated Hummingbird. Then it was down to The Cathedral for Black-and-white Warbler, Worm-eating Warbler (a total of four individuals seen today, sadly one with a large lump on its chin), a female Scarlet Tanager, and male and female Summer Tanagers. We were part of a group that had gone ahead of the others and when Vaughan joined us he said he'd just had a Blue-headed Vireo. We've never seen Blue-headed Vireo! But, hurray, a minute or so later the Blue-headed Vireo reached The Cathedral and showed beautifully. The understory held the now daily-seen Kentucky Warbler and a male Hooded Warbler was again seen. A Wood Thrush was also under the bushes and a Belted Kingfisher flew over the trees. As we walked back to the vans we heard news of a Common Nighthawk down the road. We started to walk down and the vans went past. We looked at each other and hoped it wasn't far to walk - it wasn't. We arrived at a small grassy carpark by a baseball (I think) stadium and there in the middle of the area was a Common Nighthawk. Frantic shouting managed to stop someone reversing over it! It sat there happily for a while then flew off towards Boy Scout Woods, calling loudly.